Nevada is a state located in the western United States. The population as of July 2004 was estimated to be 2,334,771, up nearly 17% from the 2000 census figure of 1,998,257. Nevada is the fastest growing state in the country. Between 2000 and 2003, Nevada's population increased 12.2%, while the USA's population increased 3.3%. Between 1990 and 2000, Nevada's population increased 66.3%, while the USA's population increased 13.1%. Nevada's nickname is "The Silver State," and the state's motto is "All for Our Country." "Home Means Nevada" by Bertha Rafetto is the state song. The phrase "Battle Born" is on the state flag; "The Battle Born State" is the official state slogan, as Nevada was admitted into the union during the American Civil War. Despite the name's derivation from the Spanish word nevada meaning "snowy," the local pronunciation of the state's name is not "Ne-vah-da"; the middle syllable has a short a sound as in cat or hat. (Residents often regard the pronunciation as a test of whether visitors such as presidential candidates, have informed themselves about the state.) In 2005, the state issued a new series of license plates that list the name of the state as Nevada to help with the pronunciation problem. Several United States Navy ships have been named USS Nevada in honor of the state. State motto: "All for our country"
Nevada has borders with Oregon and Idaho to the north, California to the west, Arizona to the southeast and Utah to the east. The border with Arizona includes the Colorado River and Hoover Dam. It is in a mountain region that includes semiarid grasslands and sandy deserts, and is the most arid (dry) state in the nation. Nevada is a land of rugged, snow-capped mountains, grassy valleys and sandy deserts. The northern and central portions of Nevada are mostly within the Great Basin Desert, while portions of the southern tip are within the Mojave Desert. In 1850, the U.S. Congress established the Utah territory which included the present day states of Utah, Idaho and Nevada. 1859 saw the discovery of the Comstock Lode, a rich outcropping of gold and silver, and Virginia City sprang up. This discovery brought a flood of miners, prospectors, merchants and others hoping to strike it rich. On March 2, 1861, Nevada separated from the Utah territory and adopted its current name, shortened from Sierra Nevada (Spanish for "snowy range"). On October 31, 1864, just eight days prior to the presidential election, Nevada became the 36th state in the union. Statehood was rushed through despite Nevada's tiny population to help ensure Abraham Lincoln's reelection and post-Civil War Republican dominance in congress. As Nevada's mining-based economy tied it to the more industrialized Union, it was viewed as politically reliable (as opposed to the more agrarian and Confederate-sympathizing California). Nevada achieved its current boundaries on May 5, 1866 when it absorbed the portion of Pah-Ute County in the Arizona Territory west of the Colorado River. The transfer was prompted by the discovery of gold in the area, and it was thought that Nevada would be better able to oversee the expected population boom. This area includes most of what is now Clark County, Nevada. Negotiations are currently underway for Nevada to annex Wendover, Utah, which would be merged with West Wendover, Nevada. This deal will require the permission of both the Nevada and Utah legislatures and the U.S. Congress. Mining shaped Nevada's economy for many years. In the late 1800's, the Comstock Lode played out, and Nevada went into a tailspin. There was even talk of stripping away statehood, the only time in American history such an action was discussed in Congress. However, the rich silver strike at Tonopah in 1900 helped save the state. This was soon followed by strikes in Goldfield and Rhyolite in the following years. These strikes lasted well into the 1910s and made Nevada a dominant player in mining once again. Mines still control a good percentage of Nevada's economy. Gold from the Carlin Trend in Northern Nevada is the second richest in the world. Other minerals, such as copper, molybdenum, and lithium, are also mined. Despite Nevada being the third oldest western state, it is referred to as the "Permanent Colony" as over 87% of the land is owned by the Federal Government. The primary reason for this is that homesteads were not permitted in large enough sizes to be viable in the arid conditions that prevail throughout Nevada. Instead, early settlers would homestead land surrounding a water source, and then graze livestock on the adjacent public land, which is useless for agriculture without access to water (this pattern of ranching still prevails). The deficiencies in the Homestead Act as applied to Nevada were probably due to a lack of understanding of the Nevada environment, although some firebrands (so-called "Sagebrush Rebels") maintain that it was due to pressure from mining interests to keep land out of the hands of common folk. Gambling was common in the early Nevada mining towns, but was outlawed in 1909 as part of a nation-wide anti-gaming crusade. Due to a sharp decline in mining output in the 1920s and the decline of the agricultural sector during the Great Depression, Nevada re-legalized gambling in 1931. At the time, the leading proponents of gambling expected that it would be a short term fix until the state's economic base widened to include less cyclical industries, however re-outlawing gambling has never been seriously considered since. A fictional history (with a great deal of fact) titled Nevada was written by Clint McCullough. Due to the tremendous growth of Las Vegas in recent years, there is a noticeable divide between politics of Northern Nevada and Southern Nevada. The north has long maintained control of key positions in the state government even while the Las Vegas area is larger than the rest of the state (the "cow counties"). This has fostered resentment as the north sees the south as a potential bully of majority rule and the south sees the north as the "old guard" trying to rule as an oligarchy. Most people outside the state are not familiar with this rivalry. The state is not dominated by either major political party. Democrat Bill Clinton won the state in the 1992 and 1996 presidential elections and Republican George Bush won Nevada in 2000 and 2004. In 2004, George Bush narrowly won the state's 5 electoral votes by a margin of 2 percentage points with 50.5% of the vote. Las Vegas' Clark county, which contains the majority of the state's population, was the only county to vote Democratic. The Bureau of Economic Analysis estimates that Nevada's total state product in 2003 was $88 billion. Per capital personal income in 2003 was $31,910, 19th in the nation. Its agricultural outputs are cattle, hay, dairy products, onions and potatoes. Its industrial outputs are tourism, mining, machinery, printing and publishing, food processing, and electric equipment. It is well-known for gambling and nightlife. Large, luxurious casinos in Las Vegas, Lake Tahoe and Reno attract visitors from around the world. Nevada is also one of only a few states with no personal income tax. According to the Census Bureau, as of 2003, the population of Nevada was 2,241,154. The five largest ancestry groups in Nevada are: German (14.1%), Mexican (12.7%), Irish (11%), English (10.1%), Italian (6.6%), American (4.8%). Nevadans of British ancestry dominate most counties in the state. 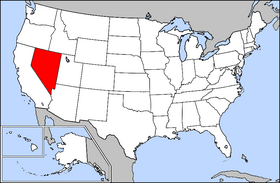 Las Vegas and Pershing county are heavily Mexican; Nye and Humboldt counties have large German-American populations. 6.8% of its population were reported as under 5, 26.3% under 18, and 13.6% were 65 or older. Females made up approximately 50.7% of the population. As a result of its rapid population growth, Nevada has a higher percentage of residents born outside of the state than any other state. Nevada is also reputedly the home of Area 51, a top-secret installation the U.S. federal government has always denied existed. Area 51 is supposedly located in Groom Lake, near Nellis Air Force Base. Interstate 15 passes through the southern tip of the state, serving Las Vegas and other communities. It has spur routes I-215 and I-515. Interstate 80 crosses through the northern part of Nevada, reaching from Utah in the east and passing westward through Reno and into California. It has a spur route, I-580. Nevada also is served by several federal highways: US-6, US-50, US-93, US-95 and US-395. There are also 189 Nevada State Highways. The state is one of just a few in the country that allow semi-trailer combinations with three trailers—what might be called a "road train" in Australia. However, American versions are usually smaller, in part because they must ascend and descend some fairly steep mountain passes. Union Pacific Railroad has some railroads in the north and in the south (map). Amtrak's California Zephyr uses one of the northern branches in a daily service from Chicago, Illinois to Emeryville, California serving Elko, Winnemucca, Sparks, and Reno. Burlington Northern Santa Fe has trackage rights to the Union Pacific lines in the north. Amtrak provides bus services from Las Vegas to Needles, California and Los Angeles. Greyhound Lines also provides some bus services. Las Vegas has a bus network, and a monorail system that is being extended. McCarran International Airport in Las Vegas is one of the busiest airports in the United States. There are also bus services in Reno/Sparks, and from there to Carson City. Some counties do not have public transport at all, for example Eureka County.